The Bara-En in Ishikawa is an unusual restaurant. From the outside it looks like fairytale palace transplanted from Disneyland. Neither is the illusion dispelled on stepping through the door. 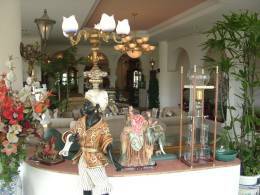 There are chandeliers, ornate statuary, lanterns and exotic plants. Most of the seating is enormous armchairs and over stuffed sofas at low tables. Though there are some rococo chairs at some round tables by the windows. Going inside is like entering the home of some extravagant film star with a taste in baroque furnishings in the golden age of Hollywood. The owner, who has been thirty years in the restaurant trade, said he was inspired for his interior design ideas by gangster films he had seen. He imported all the furniture to achieve the florid, European look he desired. Bara-En has been open since last Christmas Eve. Most of the customers the day DG visited were groups of women gossiping over extended coffees and snacks and this is the type of clientele that has prevailed until now. But the restaurant has a lunch menu too and this week a new dinner menu is being inaugurated. You would expect all the visual flamboyance of the film-gangster interior to be reflected in the prices, but in fact Bara-En is a modestly priced place. The most expensive item on its lunch menu, available 11 am to 2 pm, is Lobster, Steak, Salad and Soup with wine or a soft drink for ¥2,500. 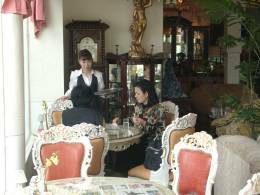 The other items on the lunch menu are priced between ¥600 and ¥800. If chosen as special of the day, they come with a soft drink. DG tried Butter Fried Flounder, Salad and Soup which was well cooked, nicely balanced and filling. The cutlery came in a gold wire basket. It and the delicate china amidst the theatrical flourishes of the décor create the feeling of fine dining in a luxury setting. Surveying the other customers DG could well understand how agreeable a venue it was for catching up on all the news from one’s girlfriends. But it would be a good place to go in a pair for lunch or dinner too. Also on the lunch menu is fried pork with ginger and salad, fried rice with lettuce, curry rice, omelet rice and three types of spaghetti: with Japanese mushrooms, with meat sauce and with fish roe. All these dishes are served with soup. Soup on its own is ¥200. Bara-En has a selection of cakes for ¥250 to ¥350. They include, chocolate, cheese, green tea and custard tart with strawberries and cream puffs. DG tried blueberry which was rich, sweet and satisfying. There is also a good selection of coffees and teas which all cost ¥400-¥450. The coffees include Mocha, Colombian, Brazilian, Blue Mountain, iced and Vienna. The teas are Darjeeling, apple, mint, rose-hip and iced. Four varieties of toast are available here: with butter or jam, cinammon, French and pizza toast, costing ¥300-¥350. There are also some other snacks and soft drinks. Bara-En has a few wines in stock at ¥1000 a half bottle and ¥2000 a full bottle. Beer is ¥500. In summary this a sumptuously furnished place with well chosen but not over-ambitious menu that will not break the budget. It is open 9 am to 12 pm.